The objective of this study was to evaluate the influence of tree foliage species supplemented in ruminant diets based on Pennisetum purpureum on the in vitro digestibility and fermentation, microbial biomass synthesis and enteric methane production. Seven experimental diets were evaluated, including a control treatment based on P. purpureum (PT) grass, and six additional treatments supplemented with 30.0% foliage from Neomillspaughia emargiata (NE), Tabernaemontana amygdalifolia (TA), Caesalpinia gaumeri (CG), Piscidia piscipula (PP), Leucaena leucocephala (LL) and Havardia albicans (HA). A randomised complete block design repeated in two periods (block) was used. The highest gas production (P < 0.05) was recorded in treatments TA and PT (237 and 228 mL g−1, respectively). The highest in vitro digestibility of dry matter (IVDMD) and organic matter (IVOMD) (P < 0.05) was recorded in the control treatment PT (57.9% and 66.1%, respectively). Treatments LL, NE, TA and PP promoted greater microbial biomass synthesis (290, 223, 220 and 213 mg g−1, respectively) (P < 0.05). The proportion of propionic acid also increased in these latter treatments and in treatments CG and HA (P < 0.05). Additionally, treatments LL, PP, NE and TA decreased methane production (25.8, 29.5, 30.6 and 31.8 L kg−1 of digested dry matter, respectively). 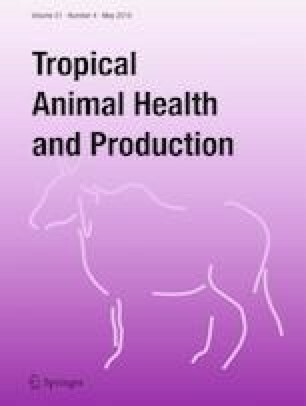 In conclusion, supplementation with L. leucocephala, P. piscipula, N. emargiata and T. amygdalifolia in ruminant diets based on P. purpureum is one feed alternative that can promote greater efficiency and synthesis of microbial biomass, increase the proportions of propionic and butyric acid and decrease the production of enteric methane by 15.6 to 31.6%. We acknowledge Ph.D. José Enrique Botello Álvarez and MsC. Marcela Guadalupe Téllez Martínez, for their support in the laboratory of the National Institute of Technology in Celaya, Guanajuato, and to Sayuri Hernández for her assistance with the experiments. We would like to thank the National Council of Science and Technology (CONACYT) for the scholarship granted to the first author and for financing the project “Cuantificación de emisiones de metano entérico y óxido nitroso en ganadería bovina en pastoreo y diseño de estrategias para la mitigación en el sureste de México” (CONACYT-SEP CB 2014). The author MsC. Samuel Albores Moreno has received research grant from CONACYT. The other authors declare that they have no conflict of interest.